Imagine holidays at one of the Varadero’s most beautiful beaches in Cuba with over 1.5km of fine white sand and the crystal clear waters of the Caribbean Sea to mesmerise your senses. Imagine staying at an all-inclusive resort that offers endless possibilities to enjoy an unforgettable holiday with your family, loved one or friends and the perfect point for heading out to explore and adventure. You’ll have everything you need at hand for water and beach sports, and you can plan all the activities you’ve always wanted to do but never dared to try. 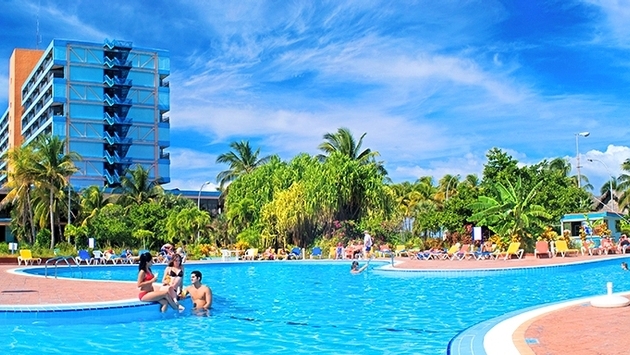 This is a resort where beach sports take centre stage: BelleVue Puntarena**** BeachFun4Life. Start your day with a good volleyball serve, whether you’re travelling alone or your companions are having a lie in, you’re sure to find someone to play with and you’ll meet great people. Prepare your best shots and aim for goal in beach football or grab a badminton racket and see if you sill have that special touch! Any or all of these activities are sure to whet your appetite, so why not stop for breakfast at the Horizontes buffet restaurant, or maybe an aperitif at the Take Away snack bar. The day can then continue with a few goals in a game of water polo in the pool or some grass hockey. Or if you’re more a water sports type, you can try captaining a pedal boat for the day, or for the more adventurous crew, you can battle your wits against the wind and the waves with some windsurfing. And if diving is your thing, well that’s also available on the beautiful beach in Varadero. At BelleVue Puntarena**** BeachFun4Life you will have a choice of activities to choose from in different parts of the hotel every day! And after an adrenaline filled day, there’s nothing better than a good nourishing meal at the Horizontes buffet restaurant, or you could try an à la carte dinner at the El Dragón de Oro Asian restaurant or try some Creole cuisine at La Costa. And to wrap up the day, why not savour an unforgettable sunset over the beautiful beach in Varadero, or another option is in the pool with a cocktail in your hand that’s been lovingly prepared by one of the friendly bartenders from the Arcoiris pool bar. Get ready for the following day because the fun never ends!